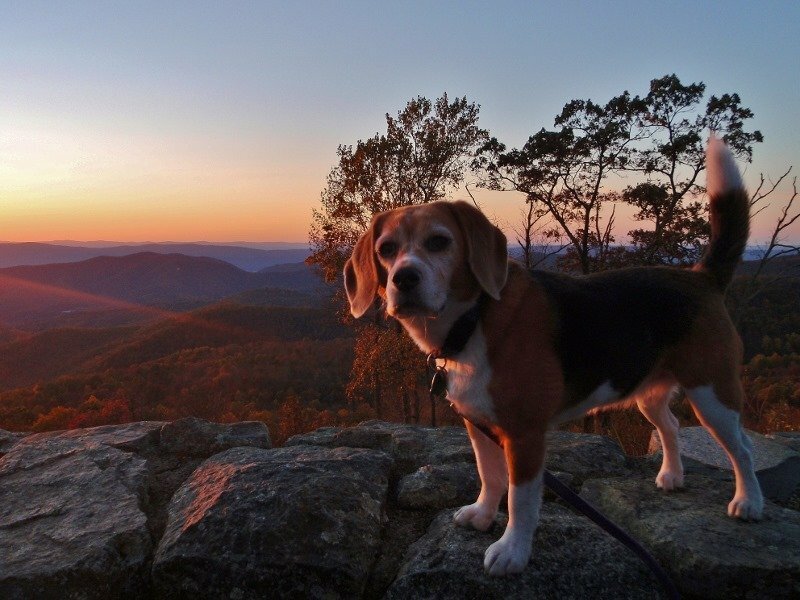 Anne and I have traveled many times with our two beagles along with us, Oscar a 45 lb. male and Angie a much smaller 20 lb. female. It is one of the reasons we decided to see North America in an RV. We desired to embark on a one year trip and couldn’t imagine leaving our beloved pets at home. We don’t have children and our two dogs are very much part of our family. 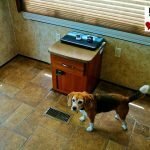 After 4 years living full-time in the Fifth Wheel Trailer and countless short trips in our camper van we have learned a few things about RVing with dogs. 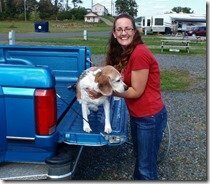 In the following sections you’ll learn some of the main things to consider when RVing with Dogs and tips we have discovered along the way. The basics for life. Make sure you have your dog on a brand of food that is available in many locations. Switching a dog from brand to brand can many times cause digestive problems, not something you want on a road trip! We made sure our dogs were eating and accustomed to a type and brand of food that was available in the PetSmart chain. This chain is located all over North America so it was ideal for us. They also stock a vast assortment of foods. Generally we buy enough for 1 month or more and store it in a plastic sealed bin in the basement storage compartment. As far as water is concerned we tend to only drink purified purchased water and give that to our dogs for much the same reason as above. 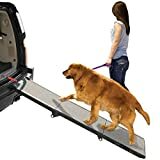 If you can keep yours and your dogs digestive system running smoothly then your trip will be much more enjoyable for all the reasons you can imagine. Use plastic bins to store the dogs food in. Feed the dog at the same time everyday so you know when the bowel movements will happen. Always travel with your veterinary records. We include these in the same place we store our passports. Make sure your dog has all the vaccines and shots needed for your journey. This may take a little research if traveling internationally. Most customs websites have sections on dogs. Rabies is always a given almost anywhere but be aware certain states or provinces may have their own specific rules. Also think about the area your going to and what parasites it may have. IE. – You may not have heart-worm in your local area but are traveling to somewhere it is a problem. The internet is always a good source of information. One time in Georgia I notice a weird oval-shaped object in Angie’s fur. Turns out it was a tick and by searching the web I was able to find out the best way to remove it and disinfect the sore. 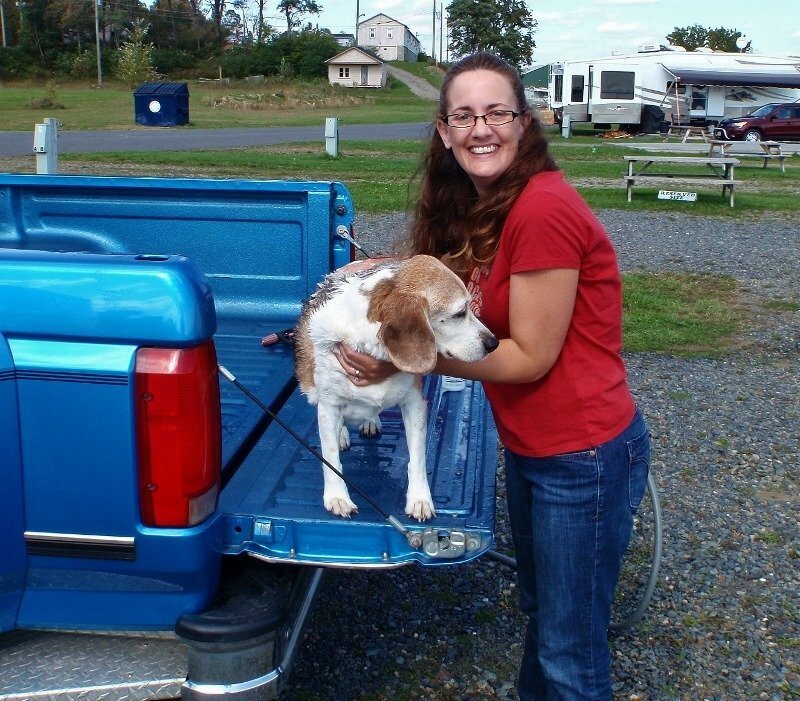 Veterinarian services is another thing you may need, especially on a long trip far away from home. When heading to a new area we do a quick Google search for local Vets and read any reviews we can find, if they are required. Don’t get a false sense of security thinking your dog will be fine on the road, things come up. Our big dog Oscar one day thought it would be fun to eat a whack of carpet when we were out. Soon enough we were whisking him off to the local vet office. You just never know what they might do, they are dogs after all. Not the sharpest tools in the shed but we love them anyway. Have your dogs ID chipped and contact details on the collar if they are lost while traveling. Keep a good first aid kit handy with pet associated meds and bandages, you may not be close to an Animal Hospital all the time. Make sure you take along enough prescription medicine for your whole trip, our dogs are on prescription flea control medication. If you can kennel train your dog it helps when vet visit is required. That way you can take the kennel and they will have some familiar surroundings if a vet stay is needed. 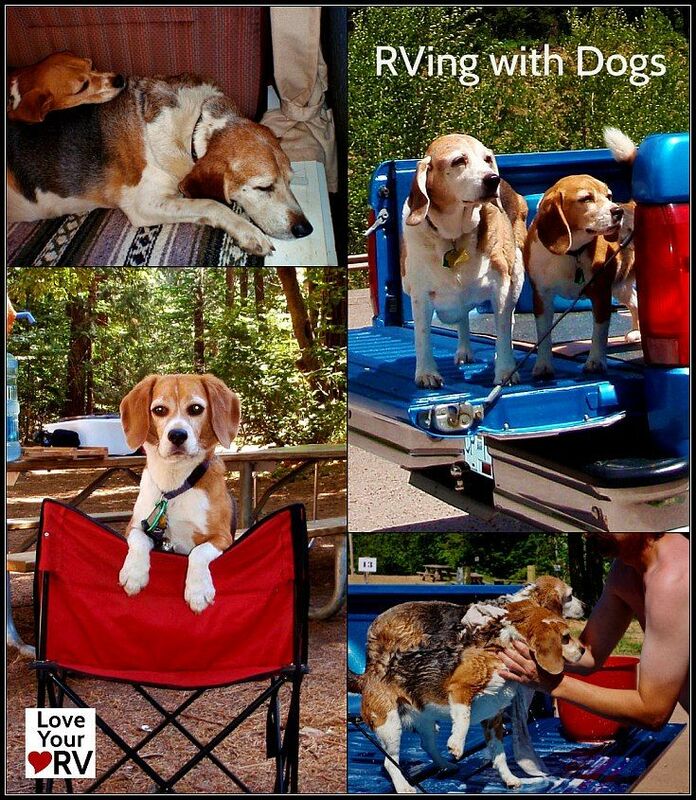 You know what they say “ A tired dog is a good dog” and this is even more true when RVing. Dogs like to explore and move. 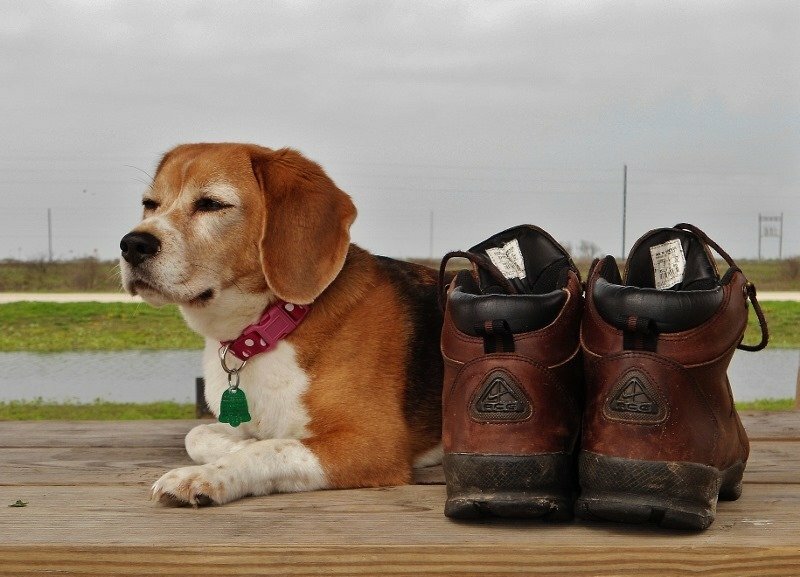 Our beagles need to sniff new things, it’s in their breed and if deprived from that they act out in some annoying way. Your breed may need to fetch or herd or run. Give them some time every day to do it. 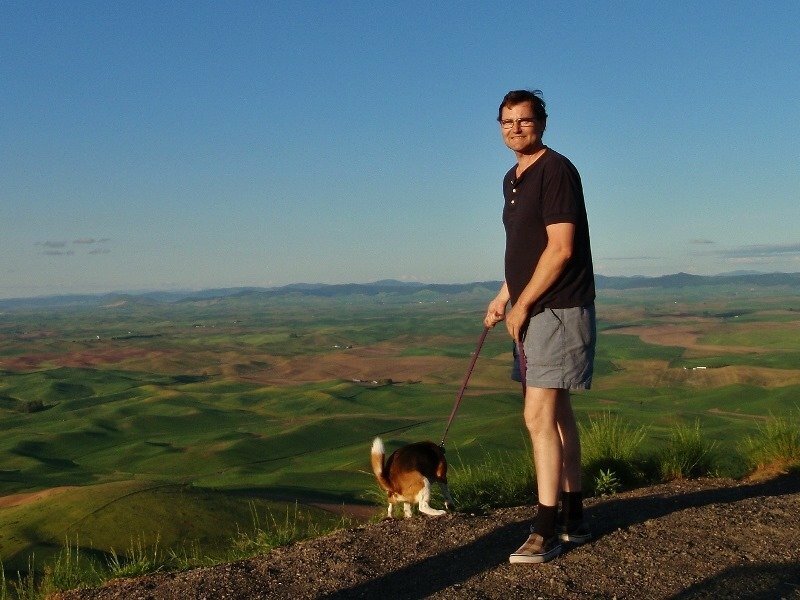 If we can take our dogs with us to a hike or day trip we will, but if not we always make sure they get a couple good walks and some mental stimulation. We taught our dogs to fetch, this allows them to get a great work out and have fun play time. We hide a treat somewhere and make the beagles find it. They love doing it and it really stimulates them mentally. Dogs like to chew so routinely give them a healthy chew treat, great for their teeth health too. It’s amazing how tired they are after a good chew. Dogs are happiest when they have a routine they can count on. Try to give them their meals, exercise , treats at similar times each day. Not only will it benefit you by them having very regular bathroom times but they will be much calmer when knowing what to expect. I try to have a morning and evening routine and include the dogs needs and activities with mine. 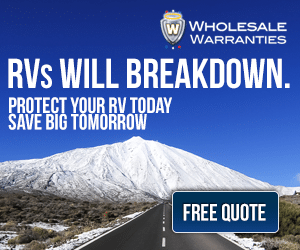 This one is a concern to all folks RVing with Dogs. Many times the dogs will have to stay behind in the rig. Sometimes it’s because we are going shopping and they can’t be left in a sunny truck or it’s a hike in National park and no dogs are allowed. We have found the best way to do it is to leave them inside their kennels in the rig. This really made sense after the carpet eating incident. 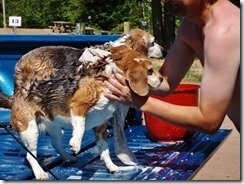 If they are in the kennels they feel secure, won’t be trying to see out the windows causing stress or if they fall an injury, and most important with beagles…. won’t eat stuff. When leaving the less fuss the better soon they will know the drill and if properly exercised will likely curl up and sleep till you return. Make sure it is a comfortable environment for them while you are gone, if it’s a cold day set the furnace to come on , if it could get hot set the AC. Generally we are most worried about the heat. We have learned how our rig reacts to the sun and when it will get too hot. If it’s that type of day we just cancel our plans and stay with the dogs. 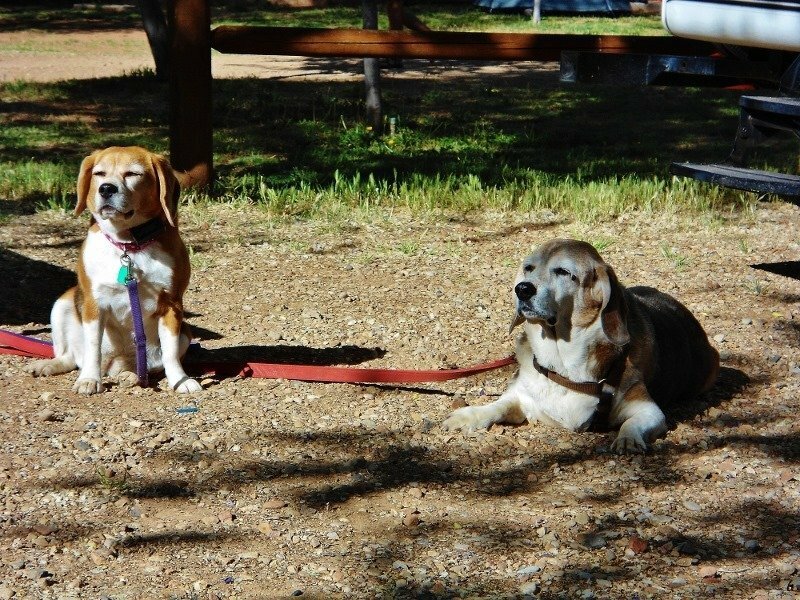 I never really trust the AC to work flawlessly in a campground, many lose power so if it is going to be a hot day we will do our exploring in the cool morning and evenings if the dogs can’t be with us. This works well for us because Anne is a photographer and likes to be out there during dawn and dusk. 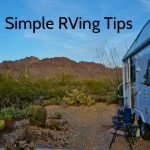 If you have a neighboring RVer with dogs see if you can switch off with them on checking out the dogs while your out. Just before leaving make sure your dog gets a good walk so they are tired and have relieved themselves. Keep all the binds down and maybe a TV or Radio playing so they are not worried about things outside. If you have to leave them for extended periods or overnight consider hiring a pet sitter. 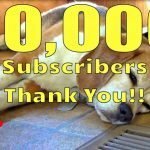 Petsit.com has a great online search. Also many Vets will take in the dogs or recommend local pet sitters. This is super important! 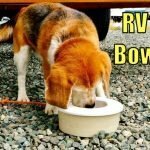 We as RVers with dogs don’t want to lose the privilege of bringing our dogs. In some places, parks are starting to ban dogs. Everyone must do there absolute best to have a quiet, well-behaved dog. Your dog should not be barking constantly when your gone. Many people are totally unaware that little fluffy is yapping constantly when the are away. I always ask my camp neighbors to let me know if my dogs do anything to annoy them. Things a dog owner would not even think about may annoy someone. By encouraging the neighbors to let you know beforehand it really breaks the ice and sets the relationship up well. Always, always have poop bags or a scoop and use them. Watch where your dog urinates, never let them go near another persons camp area or near manicured lawns and flowers. Tie your dog well away from the traffic areas and never leave unattended outside your rig. My little beagle Angie has separation anxiety and would bay when left alone. I purchased an electric shock collar and it worked almost instantly to control it. She is happier and less stressed with it on. 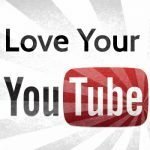 Use a video camera and record what goes on in your absence, you may be surprised. 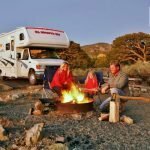 Consider doing some boondocking. 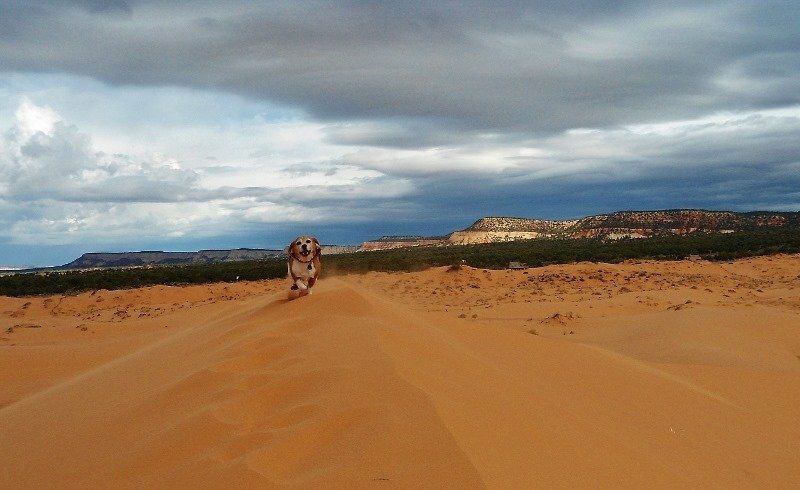 Nothing more fun than having your doggie out in an open isolated space where it can have some freedom. Too give the dog a little more freedom in the campsite consider getting some light metal fencing to form a dog pen for them. 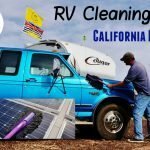 The worse part by far of RVing with Dogs is the extra cleaning that is needed inside the trailer. Ours is worse than others because we have two dogs and they both are a shedding type of breed. This is where the kennel training comes in handy. The more time they spend in the kennel the less time they spend lying around elsewhere. Also if it’s a nasty rainy, muddy day you can isolate their mess to just the kennels. We clean the hair out fairly often as my wife has allergies and if it builds up with hair and dog dander she knows way before me. We leave a towel right at the rig door and wipe them all the time if they get wet. Use a wire brush, like for cleaning metal or a BBQ, it is great at grabbing the hair from the carpet. 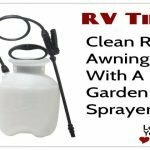 Buy a small portable shop vac and use it often. Get yourself a portable Steam Cleaner. The best mix for pet smell I have found is Borax detergent and vinegar. Cheap and effective and wont hurt the dogs. Use Sham Wow towels, they are super absorbent and work really well for cleaning a muddy wet dog. Set boundaries in side the rig where the dogs may go. We don’t allow dogs in the bedroom and on our two swivel rockers. 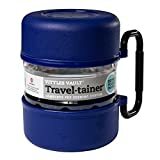 This helps keep the dog dirt confined to a smaller area. We let them have the sofa and the main floor area. Give your dog lots of baths, ours get them on the truck tailgate. It’s a perfect height and a lot of fun. While moving from place to place with the rig we keep the dogs up in the truck with us. We tried at first putting them in their kennels in the trailer but soon found out it was too rocky in there during travel and was traumatic for the dogs. Also it can get too hot and cold at times. In our pickup the rear bench seat folds down, so we have a nice piece of 4 inch foam covered with vinyl for the dogs to lay on. Along with their blankets it makes it into a nice flat dog bed. Also we installed netting so they can’t jump around from the rear to front of the truck. This makes the trucks rear area like a large dog kennel. It also keeps them isolated from the front and less likely to be a distraction while driving. I also had a rear window installed with a sliding window to give some extra ventilation if needed. As you can see we love our dogs and love to have our little furry companions with us while traveling. 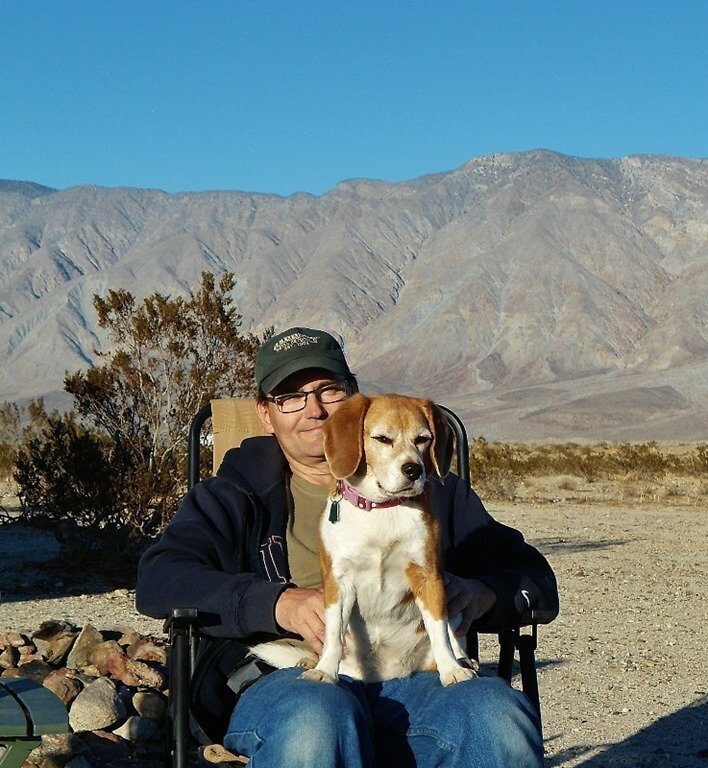 Unfortunately near the end of our last trip our older beagle Oscar succumb to a variety of ailments and had to be put down. If anyone has been through this you know how traumatic that is. 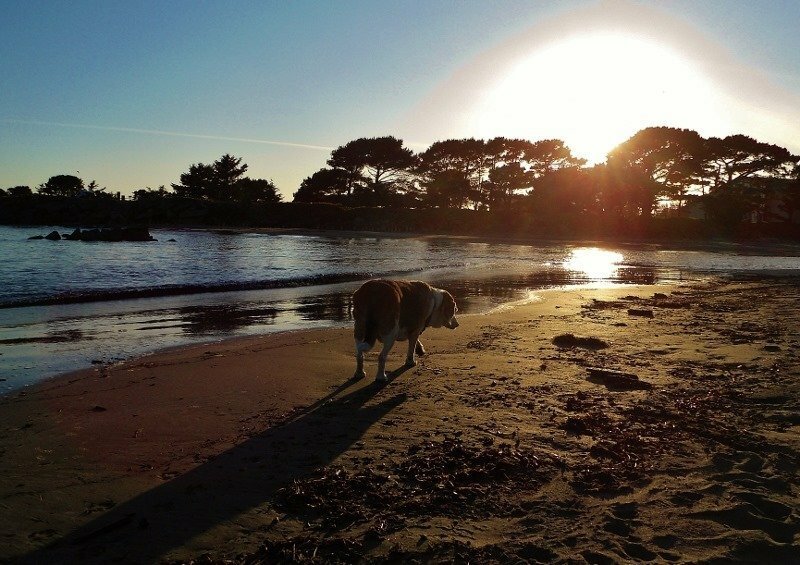 He loved the beach and on our trip got to see many and his last was his favorite on the Oregon Coast. RIP good buddy.